Do You Know The Content Life Cycle of Your Media? | Orange County SEO Company, Inc. Custom content creation is the process of writing unique and compelling content that reaches a targeted audience. While “original” content technically means the combination of words is unique, the ideas behind the content are not necessarily singular. Creating custom content is the process of taking ideas and writing about them in a new and exciting way, adding your own unique perspective. Everyone has something to say that is valuable and interesting, but few people think about using their own ideas for Internet content. In fact, many people believe that only “experts” have ideas worth of content for websites. This is not true: some of the best content on the web is written by amateurs who simply have something interesting to say. While not everyone may feel capable of producing website content, it is important that business owners take their web content into account as part of their overall advertising strategy. The reason is simple: content is what drives sales. With the focus on SEO, it is easy to think only about keywords, but the real key to reaching people is thinking about your audience. Custom content should always be written with an audience in mind with targeted keywords added in to be sure those audiences can find that content. Online brand visibility is the idea of reaching your target audience by the words you choose to promote your content. Sharing is also an important part of this process. You have to get the content to the viewers. Social media networks can help with this job, along with content aggregators. These are not ends unto themselves but channels through which you reach your audience. This infographic shows some of the steps to creating custom content and the rules that good content writers follow when producing words that reach target audiences. Gather. Ideas for content can come from literally anywhere. Surf the internet, for example, and copy examples of content you find intriguing. While you will not use this content yourself, it can serve as a springboard for ideas for original content. You can also glean ideas from television, books, magazines, movies and even conversations. Curate and write. Organize your ideas around central themes. This will be helpful as you begin to generate content of your own. Remember that you are shooting for themes that will reach your target audience. Use whatever organizational strategies you find helpful to categorize your gathered content. Write original posts or content based on your thematic groups. 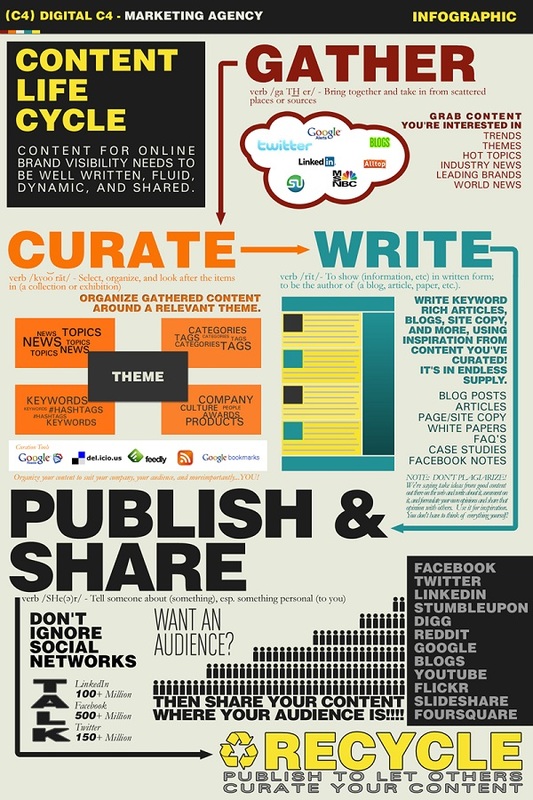 Publish and share. Good content must be seen by others. Just as you found interesting topics from your explorations, others will also find and curate your content. The top three social media outlets—Facebook, LinkedIn and Twitter—are great places to start. However, do not ignore other social media platforms, especially those used by your target audience. Orange County SEO can help you gather, curate and write great content for your website. Contact us today to see how we can help you generate original, fresh content.